Product #6648 | SKU 545B | 0.0 (no ratings yet) Thanks for your rating! 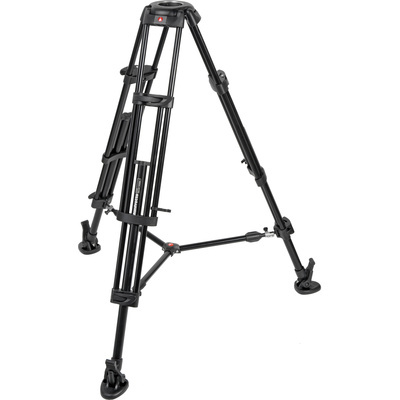 The Manfrotto 545B Pro Alu Video Tripod is a two stage, twin leg, lightweight aluminium professional video tripod. Due to optimisation of the upper and lower collars, the tripod guarantees more torsion rigidity and a payload of 25 kg plus improved shooting performance. The die cast aluminium crown features a built-in 100 mm interface bowl, which can be adapted to a 75 mm if needed. The tripod is equipped with an innovative mid-level spreader for improved tripod stability. It ships with quick on-off rubber shoes for better grip on smooth floors.